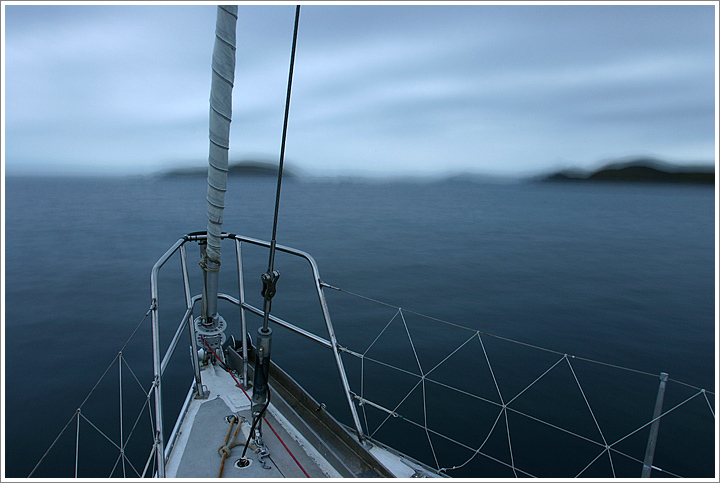 View from the bow of the expedition yacht S/V Spirit of Sydney sailing south through small islands approaching Cape Horn at dusk. Photographed January 4, 2004 using a Canon Digital Rebel and 16-35mm f/2.8 lens. Exposure 15 seconds at f/16. This entry was posted on Sunday, January 4th, 2004 at 8:51 am. It is filed under On the Road and tagged with Cape Horn, Chile, Drake Passage, Expeditions, Sailing, South America. You can follow any responses to this entry through the RSS 2.0 feed.